Paeonia Garden and Nursery is a two-plus acre plot of springtime color explosion nestled in a pastoral natural bowl surrounded by native forested hillsides a couple miles west of Sebastopol. Dr. Paul Campion, the garden’s owner, is an ophthalmologist by day job, and Paeonia’s head gardener for most of the rest of his waking hours. For five weekends in the spring, he opens the Zen-like serenity of his Asian-themed garden, bursting in a riot of color, to the public. We spoke with Paul recently to get the low-down on this unique and beautiful place. When was the garden planted? What was here before? I moved into this house five years ago, and we started the garden four years ago. The place was an Arabian horse farm, with 9 fields of heavily compacted soil, and Himalayan blackberries thigh-deep in many places. How much work was involved in creating the garden? A friend, my three sons and I worked all weekend long, every weekend, for a year and a half to prepare and install the garden. I spent most of my Wednesdays off from my practice working, too. 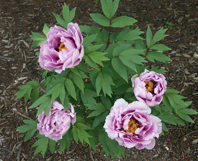 What type of soil is native to Paeonia? What sort of amendments were done before planting the garden? The soil is alluvial, from the bordering creek-bed—a clay-loam mix. We deep-ripped to three feet, and amended with horse and llama manure. We then treated the earth with a liquid compost with a soil bacteria. The property is a low spot in this hill-surrounded bowl, and had drainage problems. We created a swale for drainage to the creek, and mounded earth for planting beds, interspersed with walkways. My then eight-year old son handled the tractor better than anyone for moving earth—he had to drive standing up, because he was too short to reach the controls. Were there particular challenges in planning and planting the peony garden? Physical exhaustion, and removing the brambles. What is the microclimate like here? Again, this is a bowl, so it’s a cold sump. This is no west-county banana belt. It’s freezing or below most mornings until March. That’s of course good for the peonies, which must have winter cold. Herbaceous peonies are generally said to need 400 hours per year at under 40 degrees; the Itohs and tree peonies need respectively less. Why peonies? What first attracted you to that plant? I just think that they are the most beautiful flower there are. I’ve grown roses, orchids—nothing holds a candle to peonies. How many varieties and plants are there in the garden? I estimate around 1400 peonies total in the garden--probably about 60 varieties. We’ll have many for sale during the open house. What varieties or cultivars of peonies are of most interest to you? Chinese tree peonies—I love them for the visibility of their reproductive parts—distinctive pistils, stigma that are literally fluorescent, and full, golden anthers. I’m very fond of the Itoh hybrids (technically intersectionals) that are a combination woody and herbaceous plant—particularly the Scarlet Heaven, which is the most intense shade of red you can imagine. Do you do your own hybridizing? I keep trying for an Itoh hybrid—it takes proper fertilization and stratification, and is very tricky. What other trees and shrubs did you interplant? Paeonia is Japanese inspired, so mostly Asian-source plants—I have a number of Japanese maples, dogwood, ume (Prunus mume—Asian plum), ornamental cherries, Japanese cedar (Cryptomeria japonica), a loquat, and the entrance allee of willows that ends in the Buddha statue. What irrigation method do you use? How water thirsty is the garden? All overhead watering. It’s not overly thirsty—we water once weekly, for about two hours. What about fertilization, amendments, pest control etc.? Where in the county can peonies be grown, generally? Sunset zones less than 17 (but not including 17) should work for all types; tree and Itoh peonies should work in 17 also. 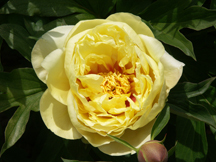 Paul, Paeonia is just an amazing, delightfully beautiful garden, and astonishing for its size and scope in four years. To what do you attribute your success? Well first, I think that the initial soil conditioning that we did was key; second, doing everything organically; and lastly, I really believe that you have to truly love your plants to have a very successful garden. What is your greatest pleasure in Paeonia? One of my greatest delights has been proving the nay-sayers wrong—everyone says ‘you can’t grow peonies in Sonoma County’—but we’ve shown them differently.